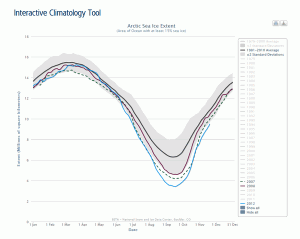 Arctic sea ice generally reaches its annual minimumextent in mid-September. This August, ice extent was the second lowest in the satellite record, after 2007. On September 3, ice extent dropped below the seasonal minimum for 2009 to become the third lowest in the satellite record. The Northwest Passage and the Northern Sea Route are largely free of ice, allowing the potential for a circumnavigation of the Arctic Ocean. At least two expeditions are attempting this feat, the Norwegian explorer Borge Ousland and the Peter I yacht from Russia. Average ice extent for August was 5.98 million square kilometers (2.31 million square miles), 1.69 million square kilometers (653,000 square miles) below the 1979 to 2000 average, but 620,000 square kilometers (240,000 square miles) above the average for August 2007, the lowest August in the satellite record. Ice extent remained below the 1979 to 2000 average everywhere except in the East Greenland Sea near Svalbard. At the end of August, ice extent had fallen to the fourth lowest in the satellite record, behind the seasonal minima recorded for 2007, 2008, and 2009. On September 3, ice extent fell below the seasonal minimum for 2009 to claim third lowest on record, with perhaps one to two weeks left in the melt season. The daily rate of decline for August was 55,000 square kilometers (21,000 square miles) per day, close to the 1979 to 2000 average of 54,000 square kilometers (21,000 square miles). Ice extent for August 2010 was the second lowest in the satellite record for the month. The linear rate of decline of August ice extent over the period 1979 to 2010 is now 8.9% per decade. In August, a pattern of higher than average pressure over the northern Beaufort Sea and lower than average pressure over the Siberian side of the Arctic replaced the stormy and cool weather conditions that persisted through July. This atmospheric pattern, known as the dipole anomaly, brought relatively warm southerly winds into the Beaufort and Chukchi seas, where air temperatures were 1 to 3 degrees Celsius (1.8 to 5.4 degrees Fahrenheit) above normal for the month of August. The warmth enhanced melt in the region, and southerly winds contributed to ice loss by pushing the ice edge northward. This pattern is similar to the pattern at the end of the 2007 melt season, but not as pronounced. Air temperatures this August were also 1 to 3 degrees Celsius (1.8 to 5.4 degrees Fahrenheit) below normal over the Barents and Kara Seas. Last year, Dave Barber, a researcher from the University of Manitoba, reported unusual conditions in the Beaufort Sea with large regions of rotten ice. Satellite imagery from the NASA Moderate Resolution Imaging Spectroradiometer (MODIS) and Advanced Microwave Scanning Radiometer – Earth Observing System (AMSR-E) sensors suggest similar conditions this year in the Beaufort and Chukchi seas, where there are large areas with unconsolidated ice floes and low ice concentration. The rate of ice loss in the summer varies from region to region depending on local air and ocean temperatures and wind patterns. This August, the decline in ice extent was unusually fast in the Beaufort and Chukchi Sea, likely because of the rotten ice that melted out completely. In addition, southerly winds linked to the dipole anomaly pattern brought warmer air into the region and helped push the ice edge northward. However, the loss rate in the East Siberian Sea and the Central Arctic was slower than any of the past three years, and was also fairly slow (slower than the 1979 to 2000 average rate) in the Laptev and Kara Seas. The reason for slow ice loss in the Kara Sea, however, is that there was already very little ice in that region at the beginning of August. Such year-to-year variations demonstrate the importance of weather conditions in determining regional ice loss. 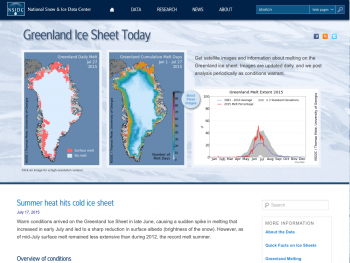 Barber, D. G., Galley, R., Asplin, M. G., De Abreau, R., K. A. Warner, M. Pucko, M. Gupta, S. Prinsenberg, and S. Julien, 2009: Perennial pack ice in the southern Beaufort Sea was not as it appeared in the summer of 2009, Geophysical Research Letters, 36, L24501, doi:10.1029/2009GL041434.